The global cosmetic bottles packaging market is foretold to be all set for a staggering growth in the foreseeable future on account of a high focus on making packaging more alluring and innovative for different types of cosmetic product consumers. This could allow cosmetic product companies to gain a greater footprint in individual target regions, reduce brand recall rates, increase sales, and enhance brand visibility. In the coming years, there could be a drastic hike in the effectiveness and importance of packaging in the cosmetic products industry. The rising usage of ecofriendly materials and the green trend could provoke packaging innovations to upgrade to the next level, thus increasing the demand in the market. According to the evaluation of Transparency Market Research (TMR), the global cosmetic bottles packaging market is envisaged to collect a hefty earning of US$8.3 bn by the completion of 2022 at a 5.0% CAGR, from a valuation of US$6.5 bn attained in 2017. 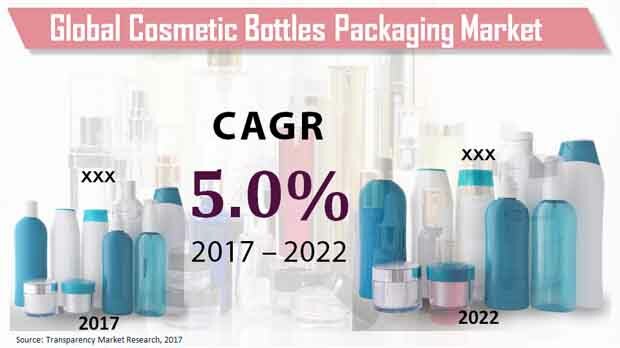 The international cosmetic bottles packaging market is envisioned to be strongly driven by the growing purchase power of consumers amid a widespread awareness about the easy availability and effectiveness of pollution protection and anti-aging products. Thus, the rising number of geriatrics in prime regions such as Asia Pacific could augur well for the market. With that mentioned, the elevating count of young consumers using cosmetic products could not be ignored as it is projected to significantly contribute toward the market growth. The younger demographic is expected to be largely attracted to packaging innovations. As a result, it could be specifically targeted by cosmetic bottles packaging companies. The international cosmetic bottles packaging market is forecasted to be segmented as per three types of category, viz. capacity, material, and application. In terms of capacity type, players could find new avenues opened up in segments such as below 50 ml, 50 ml–100 ml, 100 ml–150 ml, 150 ml–200 ml, and above 200 ml. However, the publication prognosticates the below 50 ml market to secure a dominating status by 2022 end. It could garner a share of 31.4% by the final forecast year. By material, the international cosmetic bottles packaging market is anticipated to be classified into plastic, glass, and metal. By application, segments such as skin care, hair care, makeup, and nail care could create opportunities in the market. Regionally, Asia Pacific except Japan (APEJ) is prophesied to set the tone for a valuable growth in the international cosmetic bottles packaging market by growing with a larger revenue earned even until the end of 2022. In 2017, APEJ accounted for a 32.0% share in the market. Europe could tread on the heels of APEJ while expanding at a 4.1% CAGR. Next to follow is expected to be North America with a US$1.7 bn revenue predicted to be secured by 2022. The publication studies some of the leading companies operating in the worldwide cosmetic bottles packaging market such as Aptar Group, Inc., RPC Group PLC, Gerresheimer AG, Amcor Ltd., and Albea Beauty Holdings S.A.